No antibiotics, no hormones. Ever. 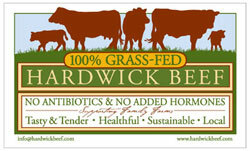 Look for the Hardwick Beef label for certified 100% grass-finished beef. In the Northeast, we are promoting a return to the practices of our forefathers. That means a return to grass farming, a technique that is gaining in popularity around the world. With grass farming, animals are moved often onto a fresh paddock so that grass is continually being grazed when the vitamins, minerals and proteins are at their best. As a result, cattle get the best possible nutrition, manure is spread evenly across the land, and the farmland actually improves with use. 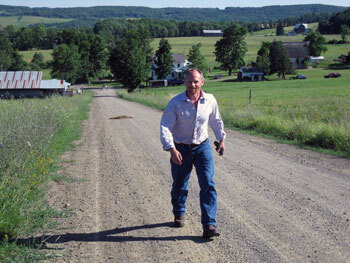 Family farms, especially in the Northeast, are disappearing at an alarming rate. It is no surprise, as farmers face pressure from developers who reward them with high prices for selling their land. Two other challenges are reaching markets for their products and getting competitive prices. We are working with farmers to develop the market for healthy meat and livestock products and to connect them with consumers who care about the quality and safety of their food. Established in 1841 by Walter Wright's great-grandfather, Fourth Wright Farm is a fourth-generation farm, raising 100% grass-fed Angus beef. 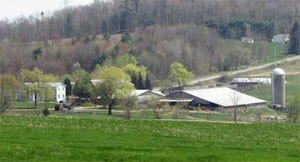 Since the 1860s, Fourth Wright Farm has been providing communities with all natural beef products. Their cattle are pastured and rotated seasonally to ensure soil quality is maintained. Mike Scannell and Joan Harris are the owners of Harrier Fields Farm in beautiful Schodack Landing (in New York's Columbia County). With Devon cattle on 80 acres of pasture, they have a strong commitment to pursue grass farming in its purest sense. Call Hardwick Beef at (860) 434-9402 M-F 9 a.m. - 4 p.m. EST.